Leicester - Riyad Mahrez's first Premier League goal of the season secured Leicester a 1-1 draw with West Bromwhich Albion on Monday but it was not enough to lift the 2016 champions out of the bottom three. 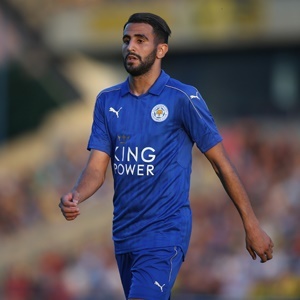 The Algerian international - who had missed a sitter earlier in the match - struck 10 minutes from time but the draw extended the Foxes winless streak to six which was the same run that saw Claudio Ranieri sacked months after delivering them their remarkable title triumph. Ranieri's replacement in the dug out Craig Shakespeare said the players deserved a win for all the effort they were putting in. "We could do with a win, make no mistake," he told the BBC. "Once we get that win then hopefully we will climb up the table. "It is tight down there and one win takes you three or four places up and that is what we aim to do." Belgian international Nacer Chadli had given West Brom the lead earlier in the second-half with a stunning long range free-kick but whilst they also saw their run without a win extended to six games they are in mid-table four points better off than Leicester. It took 35 minutes for either side to fashion a chance on goal Danny Simpson's fierce effort being parried away by West Brom goalkeeper Boaz Myhill, who was making his first appearance in the Premier League in over a year. Early in the second-half Ahmed Hegazi got Myhill into all sorts of trouble, his under-hit back-pass forcing the goalkeeper to charge from his area bringing down Jamie Vardy in the process for which he was booked by Mike Dean. "I was put in a situation where I had to take one for the team, thankfully they didn't score and thankfully I didn't get sent off," Myhill told Sky Sports. From the subsequent free-kick Myhill did well to get down and turn Harry Maguire's header round the post for a corner. Mahrez's miss took on an even more damaging hue when Chadli struck with his superb freekick after Kelechi Iheanacho's undistinguished evening continued when he fouled Grzegorz Krychowiak to give it away. However, the Algerian made amends 10 minutes from time rifling home the ball into the far corner from compatriot Islam Slimani's knockdown.